By Scott Gilfoid: Deontay Wilder says he’ll give Tyson Fury a rematch in March or April, and he feels it’s the right thing to do after the two of them fought each other to a controversial 12 round split draw last weekend at the Staples Center in Los Angeles, California. WBC heavyweight champion Wilder (40-0-1, 39 KOs) says Fury woke up in the 12th round in the abyss, and he plans on putting the 6’9″ former unified IBF/WBA/WBO heavyweight champion right back where he came from. SHOWTIME president Stephen Espinoza prefers to put the Wilder vs. Fury II rematch together in May or June of 2019. Whether that fits the timeline fort those two heavyweights is unknown. Speaking of Wilder, he likes to stay busy with his career. He might not like the idea of sitting on his backside for the next 5 to 6 months waiting for his rematch with Fury, especially given that he feels he won the fight last Saturday. The fight arguably should have been stopped in the 12th round after Wilder, 32, dropped Fury with a tremendous right-left combination that him out cold before he hit the floor. The incredibly strange part of the Wilder-Fury fight is why on earth didn’t referee Jack Reiss halt the fight when he saw Fury in that condition? It obviously worked out in Fury’s favor that he was given a chance to wake up and continue fight, but it could have ended really badly for him. Had Fury stumbled to his feet, which he clearly did, and Wilder poleaxed him with a massive right hand. Who knows what would have happened to Fury. It was just dumb luck on Fury’s part that Wilder barely missed his finisher right hand after he got to his feet. The fight hand from Wilder missed by less than an inch. Had that shot connected on the helpless looking Fury’s chin, he would have been out cold. 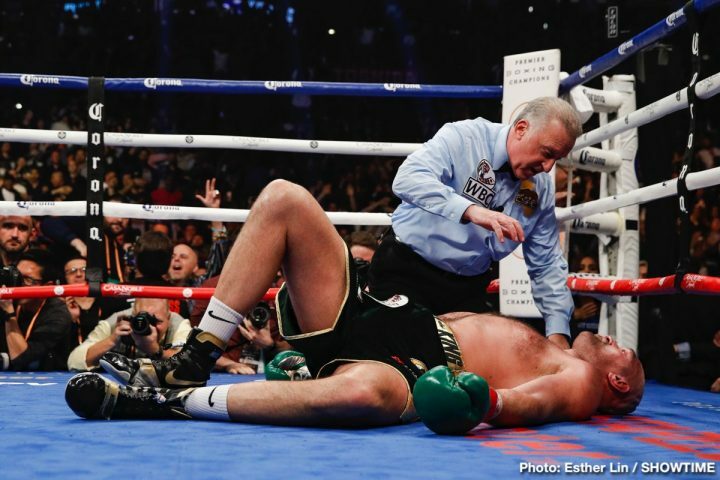 No matter how long the referee Jack Reiss would have waited for Fury to wake up, he wouldn’t have beaten the count. Joshua is busy fighting guys like 39-year-old Alexander Povetkin, who his promoter Eddie Hearn of Matchroom Boxing proudly said is the 3rd best heavyweight in the division. It’s believed that Joshua and Hearn have little interest in fighting Wilder. Deontay wanted the Joshua fight, but the perception is Hearn and AJ weren’t up to it. The $50 million offer that Joshua turned down from Team Wilder obviously showed that he didn’t fancy the fight against the 6’7″ Deontay. They want other fighters against guys like Dillian Whyte, Jarrell ‘Big Baby’ Miller and Oleksander Usyk. With Joshua abdicating his throne by failing to fight the best, Wilder and Fury have moved passed him and are both now seen as the two heavyweights in the division simply because they’re willing to face the best. Joshua is now seen by a lot of boxing fans as a guy that is milking his titles by scouring the division looking for beatable guys. Putting together a second fight between Wilder and Fury (27-0-1, 19 KOs) might not be that easy. Fury’s draw against Wilder will likely planted ideas into his head that he can pressure him to come over to the UK to fight for rematch. That’s going to be a nonstarter for the negotiations without a doubt. Wilder says he’ll fight Fury again, albeit in the United States. He’s not come to the UK and put himself in the position as the B-side challenger. Wilder is the World Boxing Council heavyweight champion. Fury is still the challenger, because he failed to beat Deontay. It’s an accomplishment on Fury’s part to have received a split 12 round draw last Saturday, but that’s not a victory and he’s very lucky that the fight wasn’t stopped in the 12th round after he hit the deck. The judges did their job as well as they could last Saturday in scoring the fight. They were put in an impossible situation to judge a fight in which both guys were landing roughly the same amount of shots each round, but Wilder’s punches were much harder. Fury looked good in making Wilder miss and hitting him with counter shots. That was a positive on Fury’s side, but he still ended up getting put on the floor in rounds 9 and 12. That canceled out a lot of the good things on defense that Fury had been doing. At the end of the night, the judges scored it fairly in saying that neither fighter deserved the victory. Never the less, the fight should have been stopped in the 12th round in the eyes of a lot of boxing fans when Fury was knocked down by Wilder, and was out cold on the canvas. If anyone was robbed in the fight, the belief is that it was Wilder was the one that got the bad end of the stick due to the referee not halting the fight after Fury went to sleep in the 12th. It’s unclear how long Reiss was willing to wait until he stopped the fight. It’s a good thing that Fury woke up, but it could have ended badly if the referee allowed the fight to continue and Fury was knocked cold for a second time with the first right hand from Wilder after he got back up. Some boxing fans think that Fury doesn’t need a rematch with Wilder, as he can treat his draw as a win and move on to a fight against Joshua. Fury can certainly do that, but it would look like a weak move on his part. It would send the message that Fury is happy with getting a draw, and doesn’t care that he was perceived as the loser of the fight by a lot of fans. Would boxing greats from the past like Jack Dempsey, Rocky Marciano, Muhammad Ali and Jack Johnson walk away from a fight that they were given a draw, and tell the fans that they saw the outcome as a victory and they don’t need a rematch? If Fury is content with getting a draw against Wilder, it tells you a lot about him.